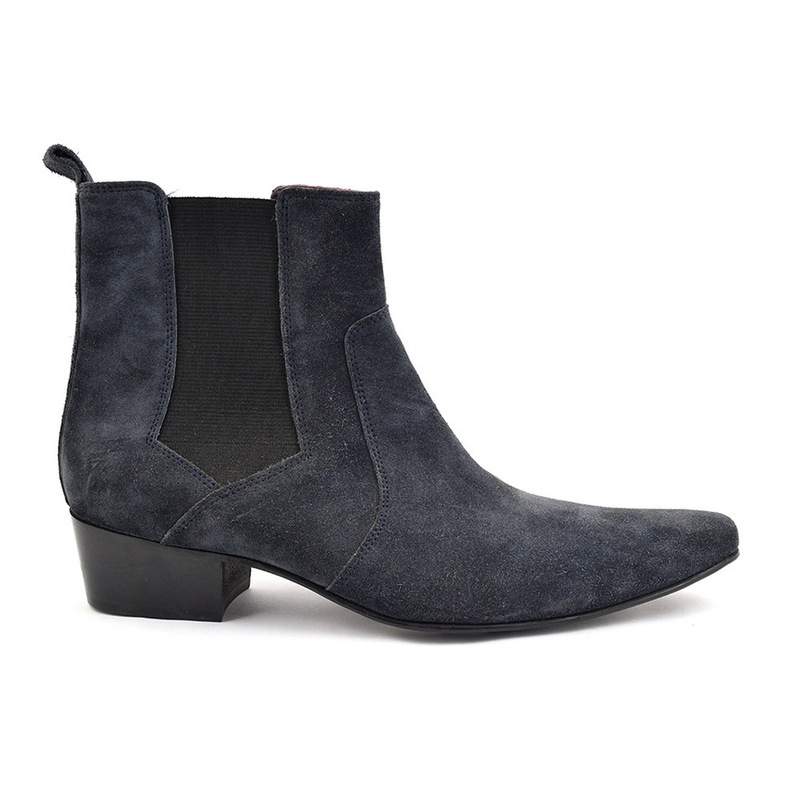 Cuban heel navy suede chelsea boot with pointed toe and 45 mm heel. Available in many colours. 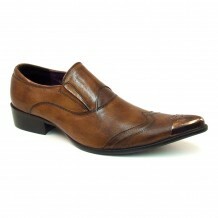 Interesting origins of heeled boots for men..take a peek below if you fancy a tiny insight. 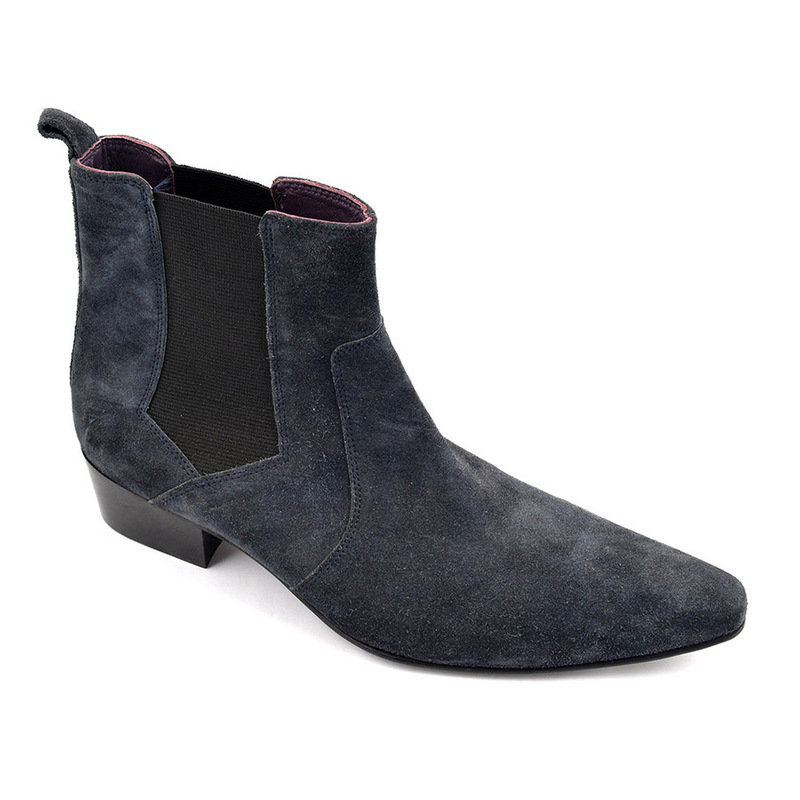 Look sharp in these mens cuban heel navy chelsea boots or more precisely Beatle boots. They have the pointed toe of a winkle picker style and the side elastic of the chelsea boot. The cuban heel is derived from the hot dances of Latin America like the Flamenco. We can go back to the 9th century to talk about men wearing heels though. There is evidence of this in an image on a Persian ceramic bowl depicting men wearing heels on horses. These heels kept them centred when aiming and firing their weaponry. Later in the 1700s, a Persian Shah making contact with Europe brought this idea over. The upper classes began to wear them and when they filtered down to the lower classes: the heel became higher! Men in heels became a status symbol for the wealthy did not need to work or walk very far. Flamboyant royals loved them. 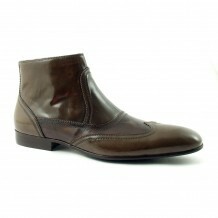 The Victorian era saw the advent of vulcanised rubber and this is when we see the first form of chelsea boot. It became a popular walking boot and of course its ease of getting on and off was popular. The 50s and 60s saw a resurgence in those boots as rock gods of the day strutted about in them and they were worn by young cool hipsters around Chelsea. These morphed into beatle boots when the eponymous band of four took a liking to them and had some made by Anello and Davide (cool shoemakers) with the addition of the cuban heel. 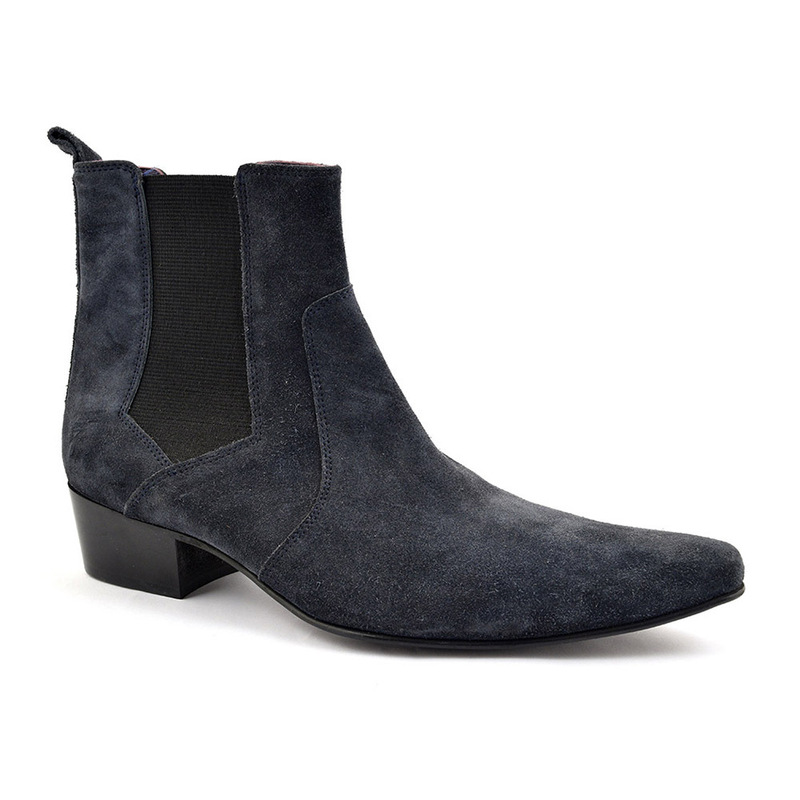 This navy mens cuban heel is in a suede and we would recommend keeping them out of the sun as light can make this fade. Suede also needs to breathe so a cool dark place is spot on. You could even stick some paper down the pointed toe to keep the shape better. 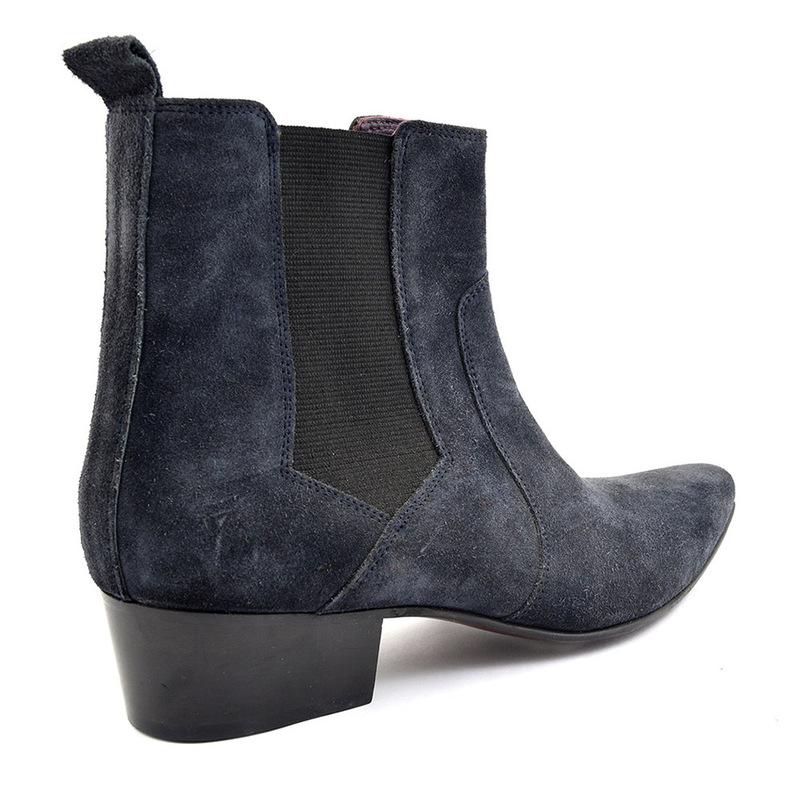 Yes you may need to look after these navy suede cuban heels but you can rest assured, they will make any outfit you put them with a little edgy and very rock and roll. 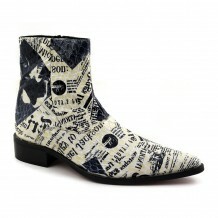 Buy various colours of mens cuban heel boots here and add some cool footwear to your collection. I love these boots. I already have received complements from several people. 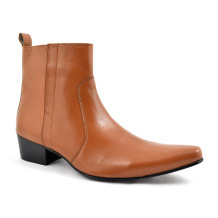 Gucinari put a heel of perfect size on these boots. I use the following adjectives to describe the heels (boots as a whole): masculine, stylish, fun and mature. The boots do not advertise “try hard.” You will love these boots. I wear a US 10.5 and the 43 fits perfectly.